Keep your EOS magazines safe and sound in an EOS magazine binder. Your library of magazines builds into a valuable photographic resource. Each binder holds eight issues (two years of magazines). 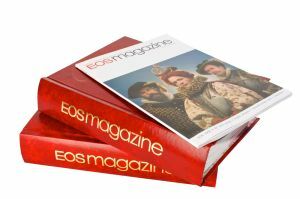 EOS magazines are a valuable resource - keep them safe in an EOS magazine binder. Each binder is finished in a stylish red marble effect with 'EOS magazine' embossed in gold on the spine. Each binder holds eight issues (two years) of the magazine. The magazines are held in place with cords. Quality item well worth the money A++. Quality materials used and extremely well made. Does exactly what it’s supposed to do - keep my EOS mags in perfect condition! Binders are essential for keeping your mags safe. Look good and space saving. An index card to record location of articles of particular interest would be useful. This will be my 7th binder (and one for my grandson ) They do what it says on the tin. Keep the magazines in pristine condition. I have several of these housing my complete set of EOS Magazines from the start of publication!